This article is about the director, producer, and screenwriter. For the musician, see Barry Jenkins (musician). Jenkins was born in Liberty City, Miami, the youngest of four siblings. His father died when he was 12, and had earlier separated from his mother, believing that Jenkins was not his biological son. During his childhood, Jenkins was raised by another woman in an overcrowded apartment. He attended Miami Northwestern Senior High School, where he played on the school football team. Jenkins later earned a Master of Fine Arts in film from Florida State University in Tallahassee in 2003. Jenkins debuted on the screen with his 2003 short My Josephine, but his first breakout film was Medicine for Melancholy, a low-budget independent feature released in 2008, starring Wyatt Cenac and Tracey Heggins. The film was well received by critics. After the success of his previous film, Jenkins wrote an epic for Focus Features about "Stevie Wonder and time travel" and an adaptation of the James Baldwin novel If Beale Street Could Talk, neither of which entered production. He later worked as a carpenter and co-founded an advertising company called Strike Anywhere. In 2011, he wrote and directed Remigration, a sci-fi short film about gentrification. Jenkins became a writer for HBO's The Leftovers, about which he commented, "I didn't get to do much." Jenkins directed and co-wrote, with Tarell Alvin McCraney, the 2016 drama Moonlight, his first feature film in eight years. The film was shot in Miami and premiered at the Telluride Film Festival in September 2016 to vast critical acclaim and awards buzz. A. O. Scott of The New York Times wrote: "Moonlight dwells on the dignity, beauty and terrible vulnerability of black bodies, on the existential and physical matter of black lives." Variety wrote: "Barry Jenkins' vital portrait of a South Florida youth revisits the character at three stages in his life, offering rich insights into the contemporary African-American experience." David Sims of The Atlantic wrote: "Like all great films, Moonlight is both specific and sweeping. It’s a story about identity—an intelligent, challenging work." The film won dozens of accolades, including the Golden Globe Award for Best Picture – Drama and the Academy Award for Best Picture at the 89th Academy Awards. Jenkins and McCraney also won Best Adapted Screenplay and overall, the film received eight Oscar nominations, including Best Director. In 2017, Jenkins directed the fifth episode of the Netflix original series Dear White People. In 2013, the same year he wrote Moonlight, he wrote a film adaptation of James Baldwin's novel If Beale Street Could Talk. Production began in October 2017 with Annapurna Pictures, Pastel, and Plan B. The film was released in December 2018 to critical acclaim. It garnered numerous accolades and acclaim, including Best Supporting Actress wins for Regina King at the Academy Awards and Golden Globes. Jenkins received an Academy Award nomination for Best Adapted Screenplay. Upcoming projects include a series based on Colson Whitehead's novel The Underground Railroad and a screenplay based on the life of Claressa Shields. The main cast will include Thuso Mbedu as Cora, with Chase W. Dillon as Homer, and Aaron Pierre as Caesar. The project was first set up more than two years ago on the heels of Jenkins’ Oscar wins for the film “Moonlight,” with Amazon officially ordering it to series last June. Jenkins is in a relationship with fellow director Lulu Wang. ^ a b c d e Stephenson, Will. "Barry Jenkins Slow-Cooks His Masterpiece". The Fader. Retrieved October 22, 2016. ^ Scott, A. O. (January 29, 2009). "In Barry Jenkins's First Movie, a Short-Term Romance Leads to Big Questions". The New York Times. Retrieved October 22, 2016. ^ Keegan, Rebecca. "To give birth to 'Moonlight,' writer-director Barry Jenkins dug deep into his past". Los Angeles Times. Retrieved October 27, 2016. ^ Buchanan, Kyle (October 21, 2016). "Moonlight's Barry Jenkins on Directing One of the Best Films of the Year". Vulture. Retrieved October 22, 2016. ^ Scott, A. O. (October 20, 2016). "'Moonlight': Is This the Year's Best Movie?". The New York Times. ISSN 0362-4331. Retrieved January 9, 2017. ^ Debruge, Peter (September 3, 2016). "Film Review: 'Moonlight'". Variety. Retrieved January 9, 2017. ^ Sims, David. "'Moonlight' Is a Film of Uncommon Grace". The Atlantic. Retrieved January 12, 2017. ^ Berman, Eliza. "'Moonlight' Wins Golden Globe for Best Picture, Drama". TIME. Retrieved January 9, 2017. ^ "Oscars 2017: 'Moonlight' wins best picture in a wild ending". USA Today. Retrieved 27 February 2017. ^ Opam, Kwame (January 24, 2017). "Oscar nominations 2017: Moonlight and La La Land will go head-to-head at the Academy Awards". The Verge. Retrieved February 5, 2017. ^ Jean Bentley (30 April 2017). "Inside 'Dear White People's' Pivotal and Emotional Fifth Episode". ^ Black, Julia (2017-01-09). "Moonlight Director Barry Jenkins Hopes His Film Pulls People Out of Their Comfort Zones". Esquire. Retrieved 2017-07-16. ^ a b Haigney, Sophie (2017-07-10). "Barry Jenkins to Follow 'Moonlight' With a James Baldwin Work". The New York Times. ISSN 0362-4331. Retrieved 2017-07-16. ^ "'Moonlight' Filmmaker Barry Jenkins Will Write Script For Fact-Based Female Boxer Coming-of-Age Drama". IndieWire. October 7, 2016. ^ Otterson, Joe (April 16, 2019). "Barry Jenkins' 'Underground Railroad' Series at Amazon Sets Three Main Cast Members". Variety. ^ Lyndes, Haley (2019-02-25). "Barry Jenkins and Lulu Wang at the 2019 Oscars". POPSUGAR Celebrity. Retrieved 2019-03-02. ^ "Medicine for Melancholy (2008) | Awards" IMDb. ^ "Moonlight (I) (2016) | Awards" IMDb. 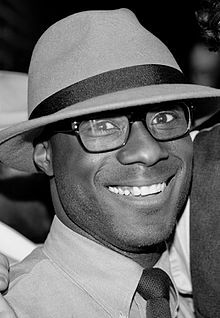 Wikimedia Commons has media related to Barry Jenkins.